In this man Jesus there is forgiveness for your sins (Acts 13:38). In these ten brief words the apostle Paul summarises the very essence of the Christian Gospel. In this Bible Focus we shall be looking at the momentous events which enabled him to make this statement. The story begins some three years previously when John the Baptist saw Jesus coming towards him and exclaimed, Look! 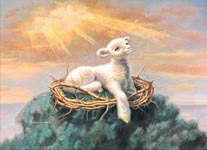 There is the Lamb of God who takes away the sin of the world! (John 1:29). In saying this, John identified our Lord with the lamb of the ancient Passover meal, the blood of whose sacrifice saved the Lord's people from death (Exodus 12:12-13 and 12:26-27). This identification is affirmed in both Old and New Testaments, as for example in Isaiah 53:7, 1 Corinthians 5:7, and Revelation 5:6-14 and 14:1-5. The Law required the Passover lambs to be without defect (Exodus 12:5 (NIV)), a requirement perfectly fulfilled by Jesus, a lamb without blemish or defect (1 Peter 1:19 (NIV)), for which purpose God chose him ... long before the world began (1 Peter 1:20) as the only one who could make perfect atonement for the entire human race (Hebrews 10:12). Jesus was crucified on the first day of the Passover, thus fulfilling all that had been predicted about him by the prophet Isaiah in Isaiah 53:7-9. The events leading up to this crucial day are described in detail in all four Gospels, as are those which followed. It is these events, and all the benefits Christians derive from them, that form The Heart of the Gospel. This is our Focus for this page. We now invite you to answer the following groups of questions. All the answers can be found in the passages of Scripture to which we have referred. These are taken mainly from the Gospels, but we have also referred to various other scriptures which serve either to confirm or to amplify the evangelists' message. Although some of the passages are rather long, we would nevertheless commend to you the practice of copying them out by hand. By doing this not only will you familiarise yourself with the events related, but also be able more easily to identify the similarities and differences between the Gospel accounts. Where the questions involve comparing accounts, we suggest you arrange them in columns, in the same way as they may be viewed on the Bible Gateway website by using the change layout command where possible. (We regret this has not been possible for question 1). You may find it helpful to go a stage further by setting the corresponding events and sayings alongside each other when transcribing them. Your answer to the first question will provide you with a general overview of the whole of the last week of our Lord's earthly life, while those which follow focus more specifically on certain critical events within that week and afterwards, together with some of their implications for our life as Christians today. From the four accounts offered by the Gospels, compile an outline 'Passion Week Diary', tracing the principal movements and activities of our Lord from his triumphal entry into Jerusalem until his burial the following Friday (Matthew 21:1-27:66, Mark 11:1-15:47, Luke 19:28-23:56, and John 12:12-19:42). the Wednesday of Passion Week is not mentioned in any of the Gospels. John places the anointing at Bethany on the day before the triumphal entry (John 12:1-8). Compare the accounts of Jesus' last evening with his disciples as recorded by the four evangelists (Matthew 26:17-30, Mark 14:12-26, Luke 22:7-30, John 13:1-38) with what the apostle Paul had received and passed on to the Christians at Corinth (1 Corinthians 11:23-25). Which elements does Paul include that are also found in the Gospels, and which does he omit? What, according to Paul, is the purpose of the Lord's Supper (1 Corinthians 11:26)? How should we prepare ourselves for the Lord's Supper, and what may be the consequences if we neglect do so (1 Corinthians 11:27-34, and see also Hebrews 10:26-31)? Reflect in detail on our Lord's trial and death by comparing the four Gospel accounts (Matthew 26:31-27:61, Mark 14:27-15:47, Luke 22:31-23:56, John 18:1-19:42). Which sayings and events are included in all four Gospels? Which are found in two or three Gospels? Which are recorded in only one Gospel? Reflect on the response of the Roman officer in charge of the execution to the death of Jesus (Matthew 27:54, Mark 15:39, Luke 23:47). Do you truly know Jesus as the Son of God? Compare the four accounts of our Lord's resurrection (Matthew 28:1-10, Mark 16:1-11, Luke 24:1-12, John 20:1-18). Which facts do all four evangelists include? Which are recorded by only one? What would be our position if Jesus had not been raised from the dead (1 Corinthians 15:12-19)? What great benefit do we gain because Jesus has been raised (see 1 Corinthians 15:20-22)? (You may like to expand this question by considering the universal consequences of the resurrection as outlined in 1 Corinthians 15:24-28). Consider the attempt made by the religious leaders to prevent, and later refute, the resurrection (Matthew 27:62-66; 28:11-15). What attempts have you heard to disprove the resurrection? How does the apostle Paul's testimony in 1 Corinthians 15:3-8 help us to counter them? How does the resurrection of our Lord prove that, This "foolish" plan of God is far wiser than the wisest of human plans, and God's weakness is far stronger than the greatest of human strength (1 Corinthians 1:25)? The four Gospels and Acts each record a selection of appearances of our Lord during the forty days following his resurrection (Matthew 28:16-20, Mark 16:12-18, Luke 24:13-49, John 20:19-29 and 21:1-14, Acts1:1-3). According to Matthew Mark and Luke, what does Jesus tell his disciples to do (Matthew 28:18-20, Mark 16:15-18, Luke 24:46-48)? Are you doing the same? Have you waited on God to receive the Holy Spirit to enable you to carry out the Lord's commission (Luke 24:49 and Acts 1:4-5)? According to John, what is the primary task of the one who loves Jesus more than these (John 21:15-19)? What should be our attitude towards those whose callings differ from our own (John 21:20-23)? Compare the various accounts of our Lord's ascension into heaven (Mark 16:19-20, Luke 24:50-55, Acts 1:6-11). What do they all affirm? Where do they differ? Reflect on our Lord's present position and activity in heaven. For his position see Luke 22:69, Ephesians 1:19-20 and 1 Peter 3:22: for his activity see Hebrews 7:24-25 and 1 John 2:1-2. What is Jesus doing for you, and for everyone who believes in him, at this very moment? John's purpose in writing his Gospel was that you may believe (or continue to believe) that Jesus is the Messiah, the Son of God, and that by believing in him you will have life (John 20:30-31). Have you received the life which Jesus died to bring you? In Philippians 2:5-10 the apostle Paul introduces a summary of Jesus' life (which some consider to be a very early hymn) with the injunction, Your attitude should be the same that Christ Jesus had. What does this passage tell us about Jesus' attitude? Are you developing the same attitude? We hope you have found this Bible Focus profitable. The possibilities for further investigation and reflection on the topics we have touched upon are virtually endless! For, in this Focus we have encountered the Bible's great theme - God's provision for the redemption of the entire human race through his only Son, our Lord Jesus Christ. Consider in detail how the Old Testament Passover is reflected in the Lord's Supper (see Exodus 12:43-13:16 and the passages already referred to in question 2 above). In particular, how does the Lord's Supper provide the Christian with a visible reminder that it was the Lord who brought you out of Egypt with great power (Exodus 13:16)? We have already seen that the blood of the Passover lamb saved God's people from physical death (Exodus 12:12-13 and 12:26-27). In the light of passages such as Romans 3:25 and 5:9-10, Ephesians 1:7 and 2:13, Colossians 1:19-22, Hebrews 9:22, 1 John 1:7 and Revelation 1:5 consider how the shed blood of Jesus, the Lamb of God, saves us from spiritual death. Consider how the predictions of Isaiah 52:13-53:12 were perfectly fulfilled in the trial, death and resurrection of our Lord Jesus Christ. Consider the wonderful expectation we have because of the resurrection of Jesus (1 Peter 1:3-6). How are we to respond to the 'down side' of our present life as Christians (1 Peter 1:6)? What is the purpose of these trials and what reward will you receive if your faith remains strong after being tried by fiery trials (1 Peter 1:7-9)? Jesus not only came once to win salvation for the human race, but promises he will return on the clouds of heaven (Matthew 26:64 and Mark 14:62) and that, When everything is ready, I will come and get you, so that you will always be with me where I am (John 14:3). How would you use these promises, together with a passage such as 1 Thessalonians 4:13-18, to comfort and encourage a recently bereaved Christian? How should we live in the view of the certainty of our Lord's return? Consider this question in the light of passages such as Matthew 24:37-51, Mark 13:34-37, Luke 12:35-38 and 2 Peter 3:1-14. The glorious message of the Christian Gospel is that, though all have sinned, solely because of God's gracious kindness all may be saved by faith in Jesus Christ, whom he sent to take the punishment we deserved for our sins and to satisfy his anger against us (Romans 3:22-26). This salvation was won for us even before we were aware of our need for it (Romans 5:6-8). In view of this, what peril we place ourselves in if we are indifferent to this great salvation that was announced by the Lord Jesus himself (Hebrews 2:3)! But there really is no need to do so, for Salvation that comes from trusting Christ ... is within easy reach. In fact ...it is on your lips and in your heart (Romans 10:8). Paul then goes on to explain how this is possible: For if you confess with your mouth that Jesus is Lord and believe in your heart that God raised him from the dead, you will be saved. For it is by believing in your heart that you are made right with God, and it is by confessing with your mouth that you are saved (Romans 10:9-10). We need always to remember that God's salvation is based simply and solely on a person's confession of faith in the Lord Jesus Christ, the eternal Lamb of God, by whose death our sins have been forgiven, and not by any attempt on our part to keep God's law. Indeed, this saving faith is itself a gift from God (Ephesians 2:8-9 (NIV)). The principle of salvation through faith was first established long ago through Abraham (see Romans 4:1-3 and Galatians 3:5-9). This does not mean, though, that what we do after we have been saved is irrelevant. On the contrary, it is vital that we continue to believe this truth and stand in it firmly (Colossians 1:23) and having believed, continue by living in the light of God's presence, just as Christ is (1 John 1:5-7), being careful to do good deeds all the time (Titus 3:8). It is essential that we humbly, yet consistently, display a new nature because you are a new person, created in God's likeness - righteous, holy, and true (Ephesians 4:24). It is the express purpose of this website to enable you to gain - or, if necessary, regain - your personal Confidence in the Word. It is our earnest hope that, after working through this, our last Bible Focus, you will not only have greatly increased your conviction that the Scriptures are indeed the written Word of God, but also that Jesus Christ is the eternal and living Word of God, the only One through whom we may be saved and enter into eternal life (John 14:6 and Acts:4:12). This page concludes our third main section, through which, we pray, you will have greatly benefitted from Experiencing the Bible's Power. We now invite you to explore our fourth group of pages containing Further Help and Thoughts, starting with Help with Daily Bible Reading.